If you haven’t viewed my website lately, no worries. I have been so busy traveling and working on new ventures that I haven’t had a chance to write any updates. You might notice that this is my first blog entry since April. I have managed to update my schedule every month. If you use google calendar you can sync my schedule with yours to follow of all my classes. A fabulous friend of mine uses her Iphone’s calendar to keep tabs on where and when I’m teaching. Last week I had the opportunity to take residency at one of the newest studios in Ormond Beach for an entire week. It was an absolute pleasure for me to take over all of the classes at Yoga Circle and Dance while Laura Ashland, the owner, was in Portland visiting her family. Not only did she trust me with running her studio while she was gone but she also honored me with the privilege to work with all of her students as well. It was so nice to be at one location instead of running around town as my typical wacky schedule demands. I am looking forward to taking over some of Laura’s classes in July and any other future time that she may request. The spacious studio features a round yoga mat in the middle for the instructor with other mats that petal out like a flower. Even though Laura has resumed the rest of her yoga classes at Yoga Circle and Dance for the month of June I will still be there to teach belly dance on Tuesday nights from 7-8pm. Garden of Life organic products are now being sold at Yoga Circle and Dance.The chocolate RAW Meal packets are $5, chocolate flavored RAW Protein are $3, and a variety of Organic Whole Food Bars are there for $3 each. These are great options for hungry bellies that need a nutritious quick fix after class. 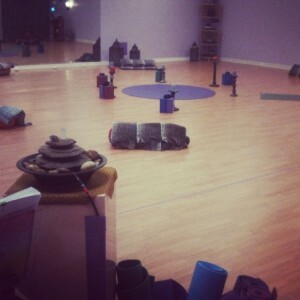 For more information on Yoga Circle and Dance studio click here.